This unassuming pub is just up from Brighton Station, a steep, but short walk up Guilford Road, has everything you need to quench your thirst and your appetite. 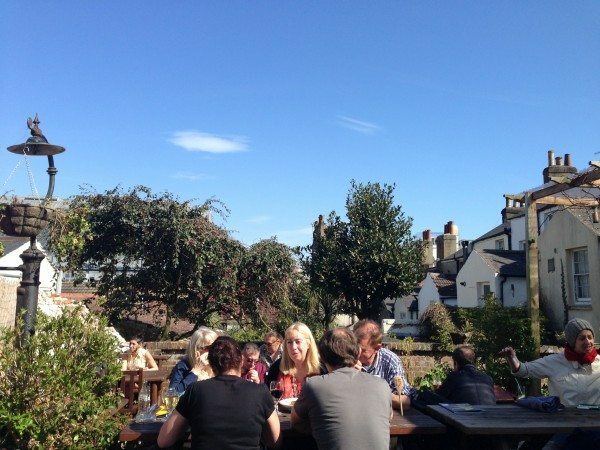 What you’ll find inside is a traditional pub that is popular all week long, ideal for local residents and commuters. It’s a shame this isn’t my local because it would be the ideal place to pop in for an evening meal on nights you just don’t want to cook, but without breaking the bank. A warm welcome from staff (Aga and Maddie), who promptly informed us there was a garden out the back, I expected to find a tiny terrace because of the type of houses around the area but was amazed at the space. “Oh, it’s big” I said, lovely pub garden, secluded, and incredibly quiet for the proximity to the city centre with mature plants. Inside, however, should it rain at all this summer, is a comfortable laid out with banquet style seating, and even the odd church pew. There was large choice of meats with a vegetarian and vegan option, which was great to see. I really thought placing the name of the meat suppliers on the board too was a great touch. This was probably the biggest Sunday roast I had ever seen. I still ate it all. And the dessert. The photos don’t really illustrate the size at all. We ordered peppered beef and a mixed roast. The peppered beef was flavoursome but I absolutely loved the pork, cooked so beautifully with crisp mouth watering crackling. What really shone through on the plate was the amount of vegetables, local greens, honey roast carrots and parsnips, broccoli, mulled red cabbage, root vegetable mash, and garlic and herb roasted potatoes – we definitely hit our five a day. The vegetables were cooked well especially the carrots which had slightly caramelised. The greens were steamed and had retained all their flavour and colour. I thoroughly enjoyed the meat to veg ratio and the authentic stock gravy. We definitely hit our 5 a day! Eating a colourful roast dinner is always enjoyable. 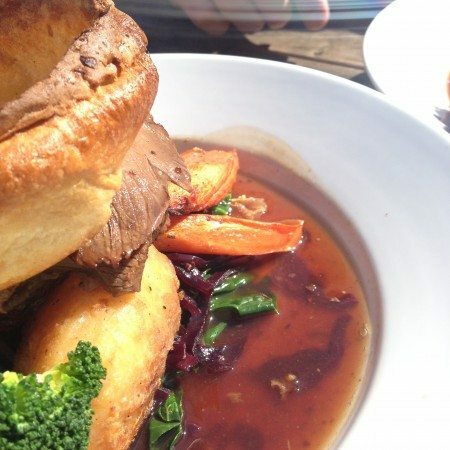 The secret’s out, with the regular flow of roasts, it’s clear that this pub has already become known for its kitchen. I am not sure many people would have room for dessert but if you’re like me and just can’t say no – then you won’t be disappointed. These really exceeded my expectations. These home made desserts looked so good I took my first bite and realised I’d forgotten to take a photo for our records. The photo of the home made chocolate brownie with homemade vanilla ice cream you see in the photo has been positioned to mask the chunk I’d already eaten (last photo in the gallery). 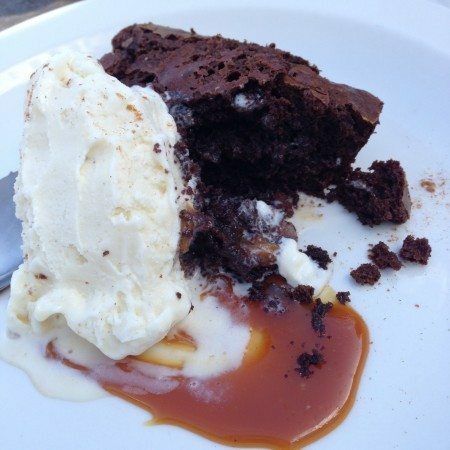 I have to say the brownie was exceptional and the ice cream light and creamy. 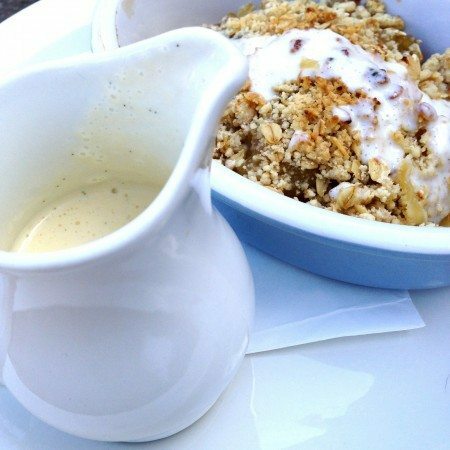 The Apple Crumble was cooked to perfection and the apples had the right amount of sweet and the right amount of bite, great crumble and the best vanilla custard. 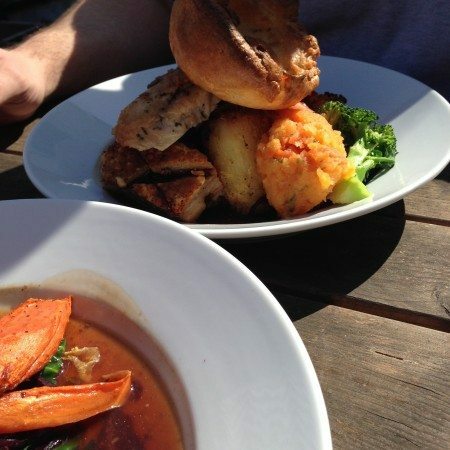 It’s not just traditional pub food we serve. Although we do have traditional dishes on our menu, we are always changing the menu to offer something different. We’re passionate about food and our menu is always evolving. Lynsey also mentioned that she will be joining a smoking course in the near future with the aim of having her very own smoke house at the Battle of Trafalgar. 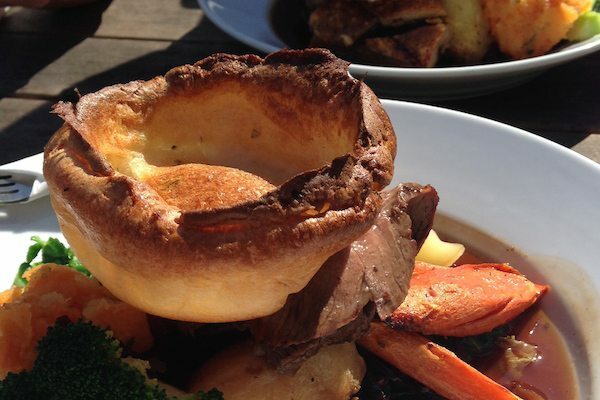 Lynsey has a clear passion to produce quality authentic dishes from farm to plate. 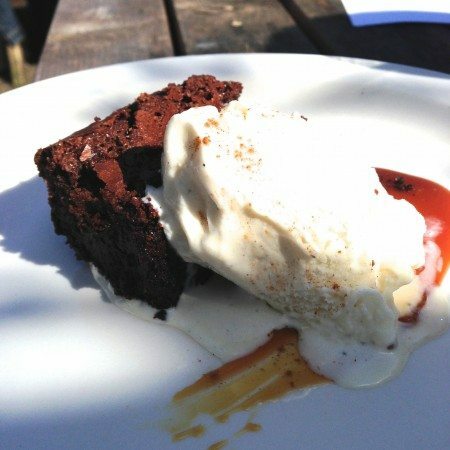 While devouring my dessert, the garden had become full with Sunday diners and a queue had begun to form inside the pub, of eager dinners waiting for a seat to become available. The only thing I could recommend to this establishment is to investigate whether there is an ingenious way to increase seating capacity for more of us to enjoy the food in this quiet, sun-soaked terrace in the heart of the city.